The Handbook of Applied Dog Behavior and Training series provides a coherent and integrated approach to understanding and controlling dog behavior. In Volume 3, various themes introduced in Volumes 1 and 2 are expanded upon, especially causally significant social, biological, and behavioral influences that impact on the etiology of behavior problems and their treatment. Ethological observations, relevant behavioral and neurobiological research, and dog behavior clinical findings are reviewed and critiqued in detail. Many of the training concepts, procedures, and protocols described have not been previously published, making this book a unique contribution to dog behavior and training literature. "Educators and students alike are constantly searching for the perfect balance of depth and breadth in a text, attempting to find the single source that will simplify their lives. Some texts are research dense but narrowly focused. Others cover a broad spectrum of topics in a given area but do not go into the related research in any depth. When it comes to dog behavior, Steven Lindsay s Handbook of Applied Dog Behavior and Training may indeed be "just right." Journal of Veterinary Medical Education, 2001, 28:43. "This is one of the most comprehensive books on the subject of dog behavior I have seen; it covers a vast amount of information." The Veterinary Record, November, 2001, 10:597. 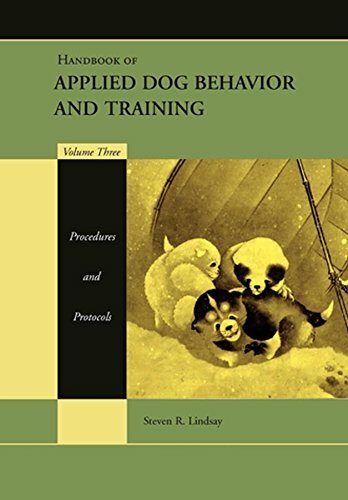 "It is difficult to overstate the importance of this book to those engaged in the field of dog behavior and training." "The two volumes of Handbook of Applied Dog Behavior and Training are a magnum opus, by any definition." Steven R. Lindsay, MA, is a dog behavior consultant and trainer in Newtown Square, Pennsylvania. He provides a variety of professional consulting and training services. In addition to his long career working with companion dogs, Lindsay previously trained military working dogs.